An applet is a java program that can be embedded in a web page. Java applications are run by using a java interpreter. Applets are run on any browser that supports java. Applets can also be tested using the applet viewer tool included in the java development kit. In order to run an applet it must be included in a web page, using html tags. When a user browses a web page containing an applet, the browser downloads the applet from the web server and runs it on the users system. Applets have certain restrictions put on them. They cannot read or write files on the user's system. They cannot load or run any programs stored on the users system. All applets are subclasses of applet class in the java.applet package. Applets do not have main method. All applets must be declared public. An applet displays information on the screen by using the paint()method. This method is available in java.awt.component class. This method takes an instance of the class graphics as parameter. The browser creates an instance of graphic class and passes to the method paint(). Graphics class provides a method drawString() to display text. It also requires position to be specified as arguments. Java program that is referenced by a web page and runs inside a Java enabled web browser. In order to run, must subclass from java.applet.Applet. Java program which is explicitly run by starting a new copy of the Java Virtual Machine. Must define a main() method in its top level class. Edit the applet class which inherits from the java.applet.Applet and save it with .java extension. Compile the java program. You will get the class file. Store the html program with the extension html. Click here for .java code. Click here for .html code. There are 4 important phases in the life cycle of an Applet. Initialization occurs when the applet is loaded. This is implemented by the init() method. An applet is started after it is initialized. This is done by the start() method. Stopping occurs when the user leaves the page containing the applet or when an applet stops itself by calling stop() method. destroy() method is used for destructions. This method performs cleanup process when the browser exits. Init() - This method is the first method to be called. This is where you should initialize variables. This method is called only once during the run time of your applet. Start() - This is called after init(). It is also called to restart the applet after it has been stopped. That is if the user goes to another page and comes back, the applet resumes execution. Paint() - This is called when each time your applet,s output must be redrawn. This may happen when u minimize the window and again restored, the paint() method is called. Stop() - This method is called when a web browser leaves the HTML document containing the applet-when it goes another page. Destroy() - This method is called when the environment determines that your applet needs to be removed completely from memory. Include appropriate <PARAM> tag in HTML document. Parameters are passed to an applet when it is loaded. We can use the init() method in the applet to get hold of the parameters defined in the <PARAM> tags. This is done using the getParameter() method, which takes one string argument representing the name of the parameter and returns a string containing the value of the parameter. Set this font and color to the graphics object. 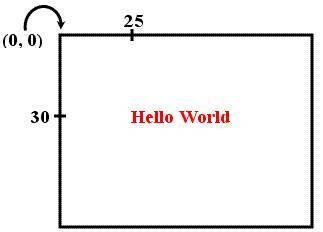 The abstract Windowing Toolkit, also called AWT is a set of classes, enabling the user to create a user friendly, GUI. It will also facilitate receiving user input from the mouse and keyboard. The AWT classes are part of the java.awt package. Components:Anything that can be put on the user Interface. This includes buttons, check boxes, pop menus, text fields. Containers:This is a component that can contain other components. This include applet window, dialog boxes etc. 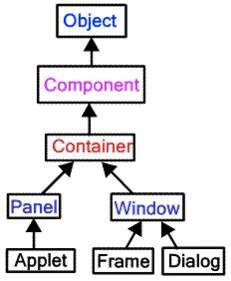 Layout Managers:These define how the components will be arranged in a container. Are visual objects with which the user may interact via the mouse or keyboard. Are grouped in 'java.awt' package. Button()- Creates a button without any label. Button(string)-creates a button with the given string as the label. They are labeled or unlabeled boxes that can be either checked off or empty. They are used for selecting some option. Use one of the following to create them. Checkbox()-Creates a checkbox without any label. Checkbox(string)- creates a labeled checkbox. Declare for the GUI component type. Call the appropriate constructor with the suitable arguments. Add the appropriate listeners to these components. They are also called as pop up lists. They enable a single item to be chosen from a list of items Choice list is created and used as follows. This is the default layout manager. Components are added to the container from left to right. When there is no space in a row, components get added in the next row from left to right and so on. By default the components on each row are centered. 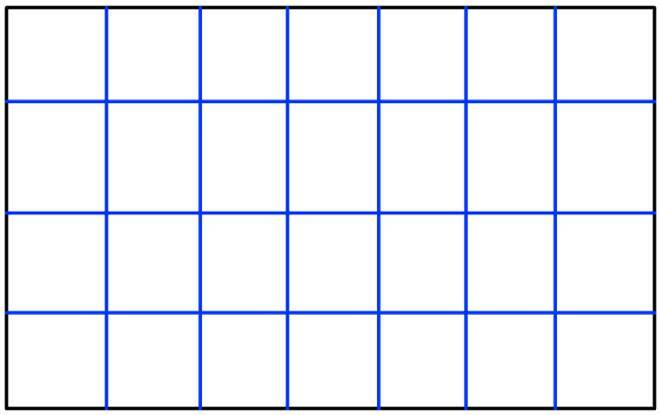 Arranges components in a regular grid; fills left - right and top - bottom. The default gap is zero between the components. In this the container is divided into five sections CENTER, NORTH, SOUTH, EAST, WEST. Generally the central component is largest than the other. It is created using the zero argument constructor or one which takes hgap and vgap as arguments. 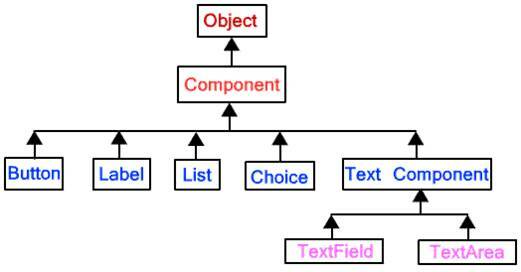 One the layout manager is set the components are added using the statement add(place, component). Place specifies the region. setLayout() method used to assign this layout manager for the container. Add(string, container) is used to add a specific container or component to the card. The card can be displyed by show() method. This is the extension of the grid layout manager. A grid layout differs from grid layout as given below. A component can occupy more than one cell in the grid. The proportions between different rows and columns do not have to be equal. Components inside grid cells can be arranged in different ways. These are the subclaees of a class called window. 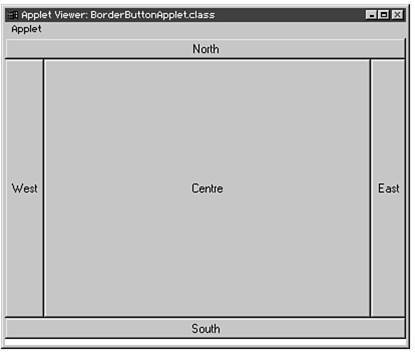 The Frame class provides a window with the title bar, close boxes, and other window feature. Frames are containers similar to panels. The default layout for frames is Border Layout. Use resize() method to provide a size for the window and show() method to show the window.